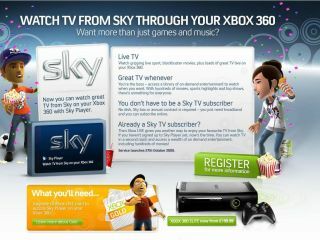 Sky has announced to TechRadar it will be bringing its on demand Sky Player to the Xbox platform on 27 October. The company leaked the new deal date in its recent magazine, but refused to confirm this was correct until now. To get the service you will need to be subscribed to Xbox Live gold and pay an additional charge. Actual pricing, however, hasn't been announced yet. The Sky Player on Xbox deal means owners of the console will get access to on demand content, as well as live streaming, as long as they have the correct Sky account (or are willing to pay for a subscription). We're still waiting for exact information on what it will bring, especially as it's missed the start of the Premier League season by some margin, but it will at least bring the satellite service to a new platform. UPDATE: Microsoft's official Xbox site has also confirmed the date, although no more details have emerged beyond that. We're still waiting for Sky to give us some more information, so watch this space.